Representatives of the International Coalition for the Rights of Iranian Refugees (ICRIR) met today with UNHCR representatives to discuss the demands of Iranian refugees in Turkey. The opening of dialogue was welcome; however, Iranian refugees in Turkey remain resolute in their decision to demonstrate against the UNHCR in Ankara. ICRIR warns the Turkish government to refrain from any violence or threat of violence against demonstrating Iranian refugees, and requests the support of the Turkish people and people worldwide in ensuring that the human rights of Iranian refugees are upheld by the Turkish government. Washington, DC, December 15, 2010 — Representatives of the International Coalition for the Rights of Iranian Refugees (ICRIR) met today with UNHCR’s Representative to the United States and the Caribbean in Washington DC to discuss the demands of Iranian refugees in Turkey. These demands are the focus of international demonstrations this weekend in support of Iranian refugees who plan to demonstrate against the UNHCR in Turkey in the coming weeks. ICRIR welcomes the opening of a dialogue with UNHCR regarding the rights of Iranian and other refugees in Turkey, Iraq, Greece and elsewhere. UNHCR representative Vincent Cochetel demonstrated willingness to listen to the needs and demands of Iranian asylum-seekers, and to work with ICRIR to improve the situation of Iranian refugees within the scope of UNHCR’s responsibilities. 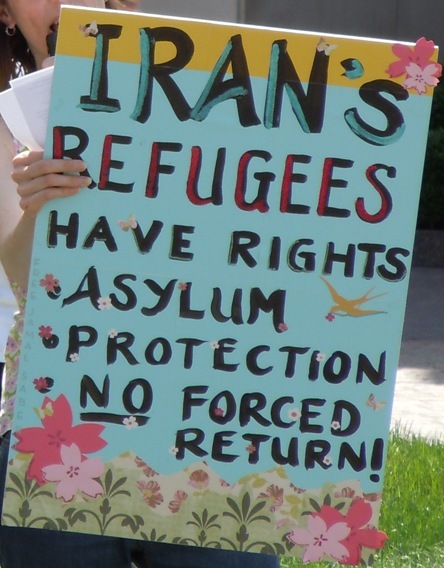 ICRIR expects to continue to advocate in support of refugees in Turkey with the assistance of UNHCR; however, as their fundamental demands currently remain unmet with no expectation of immediate resolution, Iranian refugees intend to continue with their planned demonstration in Ankara. ICRIR is extremely concerned about the safety and welfare of the peaceful refugee demonstrators in Ankara; the Turkish police are well known for their brutality, and death threats have already been received by Iranian activists in Turkey in connection with these demonstrations. We have documented the names and the UNHCR case numbers of each refugee participating in these demonstrations, and we will make those names available to the UN and to the media should any violence or threat of violence be leveraged against these individuals. ICRIR demands that the Turkish government allow Iranian asylum-seekers to exercise their fundamental right to protest without fear of reprisal. We reach out to the people of Turkey and ask them to support the human rights and human demands of Iranian asylum-seekers. At the same time that we vigorously advocate on behalf of Iranian refugees in Turkey, we urge awareness that the situation facing Iranian refugees in Turkey is not unique: Iranian refugees face continued illegal persecution and detention in Greece, and the condition of Iranian refugees in Iraq is grave and demands urgent amelioration.